The Cruise™ is the latest ultra lightweight offering from Hoover that comes with many improvements over their prior generation of cordless vacuums. It has a variety of configurations that allow you to clean just about any surface in your home. And since it is cordless you can move around freely without the hassle of staying near an electrical outlet. And when you are done you can simply hang it onto the wall charger so it is ready to go next time. Today’s cordless vacuum cleaner has seen so many improvements over the last couple years that they are now a viable option for the modern household. The biggest improvement found on the Cruise has to be the 22 volt lithium ion battery. Prior generations came with low powered batteries that didn’t hold a charge for long, typically only 10 to 15 minutes. The newer generation of batteries is much better, both in terms of power output and length of use. And not only will it last longer but the power is constant right up until it is drained. When it comes to lighter weight cordless vacuums it is always better to have constant power for the entire cleaning session. Weighing in at just under 5 pounds means that it is easy to clean just about anything you can reach in your home. With no cord you can pick it up high for those cobwebs in the corner or curtain rods, made even easier using the long pole with attachments. Plus you can use the Hoover in handheld mode to pull hair and crumbs out of your furniture. It is designed to be used with no limitations as you move from room to room with no regard for an electrical outlet or tangled cords. Unique Steerable Design makes it easy to steer around furniture, tables, or other items around the house. Tight turns are accomplished with the flick of your wrist. Multi Floor Cleaning Ability as you move from hard floors to area rugs and even lower pile carpets with the push of a button. No bending over is needed for the transition. Handheld Vacuum Conversion lets you quickly convert it to a hand vac for portable vacuuming with various attachments. Upholstery tool is just right for pulling up embedded pet hair and dust from furniture. Wall Mountable Charging bracket lets you hang it for out of the way charging when not in use. Easy to attach to any wall or closet that is near an outlet so the Cruise is ready when you need it. Easy Empty Dirt Canister empties from the bottom with the push of a button to keep the dirt and dust away from your skin. This is an allergy friendly design, and one that those with asthma or allergies will especially appreciate. Rinsable Filter means you can rinse and re-use it without having to replace it. Hoover recognizes that filters can be expensive so they designed a reusable one just for this vacuum cleaner. Hoover has been building vacuum cleaners for many years and are one of the most recognized brands. However, they haven’t been a big name in the lightweight or stick vacuum industry but the Cruise may change that. It certainly isn’t the most powerful (the Dyson Cordless V takes that title), but it wasn’t built to be. It is quite affordable and can be used in a variety of configurations in conjunction with different attachments to handle all types of surfaces with the exception of medium to high pile carpeting. For hardwoods, tile, laminate, and area rugs it is an excellent choice. 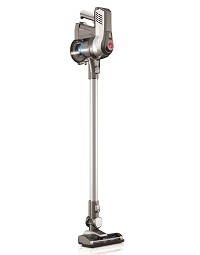 The Hoover Cruise is an ultra lightweight upright stick vacuum that can be configured in multiple ways. It works best on hard floors and low pile rugs, and optionally in handheld mode for upholstery. Hoover is known for quality and affordability which is why you see their vacuums in most of the big box local stores. One thing to remember is the Cruise isn’t designed for thicker carpets, so if you have those in your home you will need to supplement it with a larger and more powerful cleaner. Overall it is an excellent choice for the typical household with many different surfaces to clean. For current pricing and additional information including consumer reviews, click here to visit our recommended online supplier.